the ORIGINAL & most popular handcrafted leave in WORLDWIDE!!! looking for something to help keep your lovely coils and curls in top notch condition? our daily leave in conditioner will help to tame your frizzies, provide healthy conditioning, moisture, softness, and will make your hair easy to detangle! the ORIGINAL leave in conditoner for curlies and naturals in the industry…. BOOM! apply a generous amount to damp hair, leave – in and style accordingly. use daily or weekly to keep your lovely coils & curls red-carpet ready 🙂 used by all hair types including wavy, curly, coily, and those transitioning from relaxed to natural. Distilled Water (Aqua) with Olea Europaea (Olive) Oil (and) Achillea Millefolium (Yarrow) Leaf Extract (and) Salvia Officinalis (Sage) Leaf Extract (and) Lavandula Angustfolia (Lavender) Flower Extract, Vegetable Glycerin, Behentrimonium Methosulfate, Cetearyl Alcohol, Sesamum Indicum (Sesame) Seed Oil, Helianthus Annuus (Sunflower), Persea Gratissima (Avocado) Oil, MSM, Guar Hydroxypropyltrimonium Chloride (cationic guar gum), paraben-free preservative and Fragrance. Apply a generous amount throughout damp or dry hair for healthy conditioning and moisture. 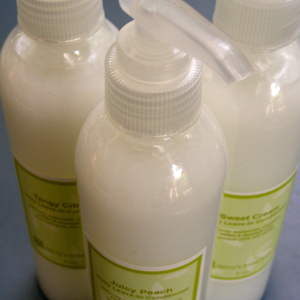 *Use to gently soften and detangle new growth while transitioning to natural hair . *Use to add much needed moisture to parched curls.